Highways opened to everybody. This was Henry Ford’s dream over a 100 years ago. That dream is now evolving, day by day, to improve people’s lives, changing the way they travel: From sharing mobility services to those of collaborative parking, from solutions to revolutionize logistics in the cities of the future, to imagine a world where streets will be reconstructed according to people needs and traffic flows. A process of evolution that wants to be as inclusive as possible and meet the needs of all people, even and especially those with disabilities. 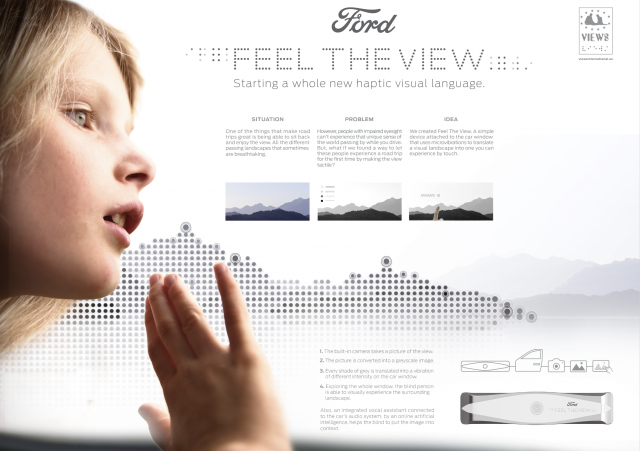 For this reason, today, Ford of Italy and GTB Roma want to bring Feel The View to life: a new innovative device, that when applied on a car window is able to decode a landscape seen from the car, allowing visually impaired people to experience it with the tip of their fingers. The device is able to transform a flat surface of a car window into a tactile display. The prototype captures and transforms the photos taken by the integrated camera into haptic sensory stimuli, not visible, perceptible through touch and hearing. The photo taken from the device is converted from the internal software into a greyscale image. This image is then reproduced across the glass window by special LEDs. The device causes vibrations of 255 different intensity at the point of touch: The lower the intensity of gray, the greater is the intensity of the vibration. The blind user is in this way able to sense the different vibrations exploring the window with his fingers and will be able to visualize and reconstruct the view into his mind. The prototype, connected to the internet, integrates a system of artificial intelligence and vocal synthesis that completes the experience: a vocal assistant connected to the Ford car’s audio system, helps the blind person to contextualize the image captured by the built-in camera, allowing them to explore all shapes of the surrounding areas autonomously, simply and intuitively. The video was made by the production company Whyworry, directed by Mauro Mancini. Special thanks to the protagonist of the video, Anna Rita De Bonis, CEO of Views International. “When the idea was at its first stage, we looked for suppliers all around the world to understand what was the best way to make it come to life” says Federico Russo, Executive Creative Director of GTB Rome. “During the last Maker Fair held in Rome we met Aedo Project, an Italian start-up specialized in devices for visually impaired people. The haptic interface implemented on some of their projects has opened up an all new world for us, allowing us to think like blind people would do. As the prototype started taking shape, we realized we were giving birth to a complete new language that would give visually impaired people a new chance to visualize and experience travelling like never before. An innovation that today is designed to use in a car, but that tomorrow could be implemented in schools and institutions for blind people as a tool that could be used in multiple ways.